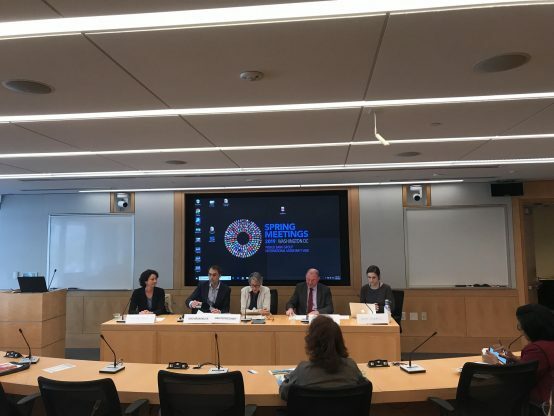 Notes from the Civil Society Policy Forum session on 10 April on the incoherence between IMF-backed austerity policies, via loan conditionality and policy advice, and the realization of the right to health. This session assessed how such policies affect enjoyment of the human right to health and discusses policy alternatives. Mariska notes that an international recommendation for health spending is for governments to allocate at least 5 percent of GDP to health, combined with an absolute target of USD 86 per person per year. Adding, “There is room for improvement for reaching the relative target for health expenditure, but few LICs and LMIC would reach the absolute target even if they would raise the budget allocation to health to 5% of GDP. Urgent attention is needed to prioritize health at national level and to scale up international action on issues such as tax justice and debt relief”. Kate moved on to discuss case studies of Egypt, Brazil and Spain. In Egypt, she noted “the economic reform package underway in Egypt, underpinned by IMF loan conditions, is centered on austerity” and is exacerbating inequalities. Access to healthcare has become squeezed, with public expenditure on health very low and declining since 2015, as shown by the civil society-led Egypt Social Progress Indicators. Studies show that “Out of pocket health expenditures have exacerbated the normalised poverty gap by 1.4 per cent” adding that personal income tax for high earners is just over 20 per cent and introduction of a capital gains tax has been stalled. In Brazil, she focused on the “devastating impact” of constitutional amendment 95, which she described as an “extreme and unprecedented step but has been vocally supported by the IMF.” Forecasts in Brazil show dramatic losses to health and education spending, Kate noted, adding that gendered impact of this has seen specialized services reduced by 50 per cent as a result of budget cuts, and a projected increase in the infant mortality rate. Despite this evidence about the impacts and the alternatives – like combatting tax evasion – the IMF’s 2018 Article IV report doubles down on austerity. In Spain, Kate stated “a big part of the austerity package in Spain de-universalised healthcare and placed restrictions on undocumented migrants accessing healthcare.” She noted that they haven’t just been documenting the impact of these measures, they’ve also been trying to challenge them, using an example of Egypt, where they worked to bring about the social accountability tool above, and in Spain, where after the new government came in to power last year, it restored universal access to the healthcare system, citing the findings of the UN committee on ESCR. On the need to create fiscal space, Gino said that international tax avoidance loses an estimated $500 billion, $50 billion losses for Africa due to illicit financial flows and that an international tax body at a UN level is critical for countries’ capacity to collect taxes and retain value of economic activity. He finished by stressing the need for “more focus on universal health coverage rather than targeted spending” as it is not an effective approach, neither is it in line with international standards. David Coady begun by saying that social spending has been high on our agenda, stressing that the priority should be for countries to not get in to a situation where austerity is needed. He noted that some of the bigger issues going forward are going to be about whether the IMF is part of the solution or the problem, citing that there was an IEO report that came back to say that social protection is uneven and there is lots of room for improvement, adding that management accepted that the IMF needed to do something about this. On the development of an institutional view on social protection, David said, “We’ve just finished a board paper, and have interacted with a broad range of stakeholders” noting that it is time to start doing that more systematically and more effectively. He continued saying that we need to look more carefully at the distribution and ask if spending fell, why did it fall? The first question was from John Kalage, of Haki Elimu in the Tanzania Education Coalition, who asked about how low-income countries are now failing to fulfill obligations to allocate resources to issues of quality, noting that some of the IMF policies have not provided the solutions to addressing the challenges and that some countries are failing to replace the resources, adding a recommendation to the IMF to consider playing a different role. David responded to say that people look to the IMF to create a macro fiscal framework where countries can recruit and that we are aware of these issues. On the question of whether the IMF would support the UN-adopted Guiding Principles for human rights at times of economic reform, David noted that the IMF should be focusing on asking if it can do a better job and tackling unevenness. He added that there’s a conditionality review going on, asking whether the IMF has the right tools and if it is monitoring how we use them. She continued to say that she really welcomes a lot of stuff out of the IMF’s fiscal affairs department that emphasizes progressive tax reform and combatting tax evasion and avoidance, but that we not seeing that same emphasis transpire in policy, and would love to see more of that. Gino added here that he would support the IMF including the human rights guiding principles in its debt sustainability framework. Iara noted here that it is interesting how institutions took the SDGs agenda while the human rights agenda is off the agenda, even though it is binding. Mariska added that the IMF has also been spurred to reconsider the strict targets on budget deficit reduction and inflation. If these targets were loosened somewhat, this would result in more fiscal space for social investments. Barry Hernan of Social Justice in Global Development asked what civil society should do to push for change in social protection, to which David responded to say that we should not talk about domestic resource mobilisation in insolation and noted that civil society and others have a role to be pushing the agenda of effectual decisions around spending. Soren Ambrose from ActionAid asked about wage bill conditionality, noting “this is something that we thought we had eliminated about 10 years ago but it seems to have made a startling return” and highlighting that ActionAid has done a series of briefings about progressive taxation, to get governments to do domestic resource mobilisation through capital gains tax and wealth tax. David responded to highlighting the case of Ghana where health and education were excluded from cuts but added that if you’re in austerity, wage bills might be part of the short-term solution, noting that it is about how you carry this out. Kate responded to say that people experience austerity cumulatively. She said that it is not any one decision that impacts human rights. It’s great that the IMF is now looking at gender and income inequality, as well as looking at the spending side, but that they also need to look at how taxes impact various groups. On the subject of wage bills, Leo Banauch of the International Trade Union Confederation noted that the delivery of health and education requires trained and well-paid public servants, adding that an effective social protection system needs this. Itai Rusike, Director of the Community Working Group on Health from Zimbabwe, said that he comes from a country that showed a lot of promise and did well in health indicators until the IMF came in with a structural adjustment programme. He noted that soon after independence, civil society was very weak and as a result, Zimbabwe lost out on the gains that the country had achieved. He noted that Zimbabwe has a broken health system, and the political elite that do not get care there, and that people are left to face the consequences. At the same time, the trade unions tried to say that the governments should not do austerity.